CES is a huge event showcasing innovations from all over the world to a global audience of around 200,000 visitors and millions more via the media. It is a great platform to assess market trends, customers and users’ needs. In this article we share our observations and learnings from CES 2018, as well as trends we think are worth watching. As we walked the show floor and explored some of the thousands of exhibits at CES 2018, we collected many interesting observations. One thing particularly grabbed our attention, it is the number of new technologies that are being built to provide humans feedback about themselves. Indeed, today’s trends are full of expressions such as self-driving, quantified-self, self-awareness, self-help, self-healing, self-coaching etc. We already knew about the big trend towards personalization, but CES confirmed how significant self-oriented concepts, technologies apps, products and services have become. Coming from the fields of coaching, psychology, neuroscience and linguistics, CES 2018 validated for us one important and sizeable societal trend: people’s desire for feedback and human empowerment. Organizations, whether they are large or small, Universities or Cities, are looking for ways to better prepare and support individuals for an inevitable ongoing change. As we know from the domains of psychology and coaching, feedback is a key way to initiate and manage change as well as to support and empower individuals. Called the Transtheoretical Model (Wikipedia) or Stages of Change Model (PsychologyToday), our society has defined a psychological human change process consisting of five steps; Precontemplation, Contemplation, Preparation, Action, Maintenance. For years Marketers have been using the model of change with three, four or more stages based on many uncertain factors, mainly, Awareness, Consideration, Decision, Maintenance. Whether we look at it from the psychological model or from the marketing perspective, the model finds a common frame as it defines a human decision-making process starting from a state of “not being ready to act or decide”, to a step of “getting ready to act or decide”, to a step of post-decision or maintenance of the action or the decision. Today, technologies in the health, wellness and wellbeing spaces focus on analyzing someone’s environment, behavior, capabilities and health-related state in order to provide a certain number of insights which a) inform a person on how she is evolving and b) inform her decisions based on the provided data (blood pressure, heart rate, breathing, stress level, weight, and other data coming from all parts of the body such as feet, legs, chest, eyes, head etc.). The CES 2018 Health/Wellness/Fitness areas showcased a majority of products and technologies focused on tracking, monitoring and feedback capabilities, most of them integrated into wearables and hardware, enabling the collection of information to provide it to its user or to its group. It seems obvious that technology is becoming a huge feedback loop for humans. Whenever and wherever you are, you can track your state and inform your decisions. Further, a majority of existing products, apps and systems, are able to suggest a choice of actions to take as a follow up to the information you are provided with. It is striking to see how technologies, products and services fit the change models, whether it is the psychological or the marketing change models. It is also interesting to see how innovations are more and more proposing a “coaching approach” in their interactions with users, to better listen, to better support and build rapport with the person. What kind of future can we expect with innovations making us ever more self-aware? Are technologies becoming the new coaching expert systems? Is technology becoming capable of psychological and transformational interactions? One additional learning from CES 2018, based on discussions with consumers and potential partners, investors and customers, is that there are two different dimensions of “coaching”. One dimension sees coaching as a subject matter expert system or individual, able to provide information, insights or even suggest solutions. Another dimension sees coaching as a process, a reflective conversation, a time for learning, where solutions aren’t provided but where learning is being developed or provoked. Are we transitioning towards an augmented human being able to continuously collect information about performance and better inform his own decisions? Will Artificial Intelligence become a mirror of humans’ behaviors trigger more and more behavioral awareness? Will technology advancement enable every human on earth to live in a continuous self-improvement and self-learning lifestyle? Among the new innovations and emerging products built to interact with people (or users), we see a big trend in the domain of “assistance”, made possible with the surge of conversational technologies and personal assistants designed to answer any of your questions or serve any request. Mankind has always been motivated to make his life easier, more comfortable and expend less effort. It seems we are finding ways to assist ourselves ever more by leveraging technological progress. A few technologies are, however, making other changes, as they advance people’s ability to think differently, enabling more cognitive development and engaging humans in the development of their own human capital. Those that are made to assist humans and answer any request. All apps and assistants that help you book or order a product or service and retrieve information are in this category. Those designed to stimulate thinking, activity, personal and collective effort. In this category, you can find apps and assistants that help you work on your mindset, mental and physical wellbeing and performance, as well as develop your critical thinking. We call them “assistants” too, but they require you to commit deliberately and make an effort to achieve your goals. One trend delegating all boring tasks to robots, and another making the best efforts to help people become more efficient. Sounds like two trends are converging to one main idea. A huge learning skill-building and self-improvement opportunity for individuals. As technological developments improve, it was easy to spot areas at CES 2018 that were focused on emerging and commoditized market segments of consumer electronics and services. With higher global internet coverage and wide peer-to-peer sharing and collaboration tools, the spread of information about new products has reached unprecedented speed. As a result, product adoption is faster, new profitable product categories are discovered sooner, if not immediately, and competition drives segments of all technologies to be a commodity as product lifecycles shorten. For example, two years ago self-tracking, smart watches and personalized digital healthcare resided in Eureka Park (the CES startup hub), while this year the number of offerings of this kind saturated the marketplace and lost consumers’ interest as well as their WHOA effect. 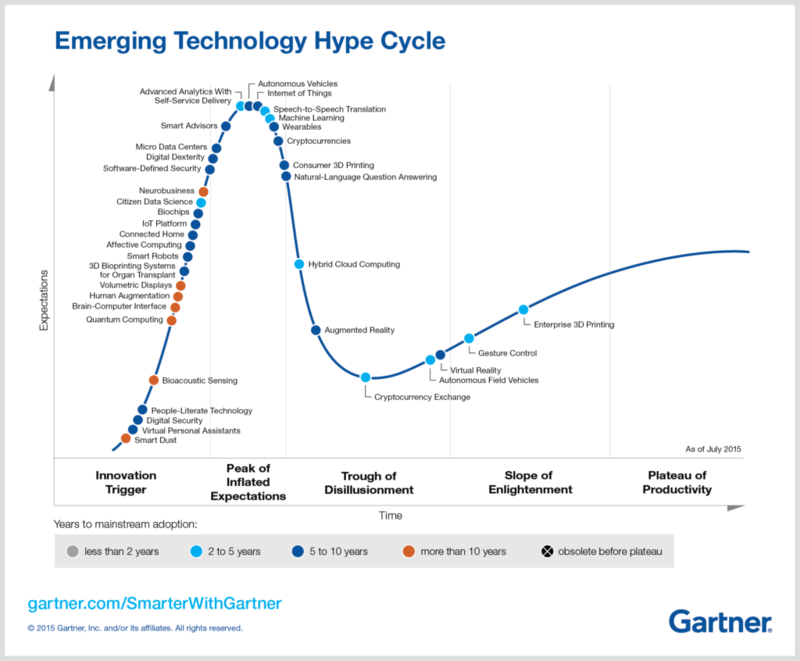 This trend is well reflected in the below Gartner’s Hype Cycles. In 2015 wearables and smart advisors reached the phase of “inflated expectations”. 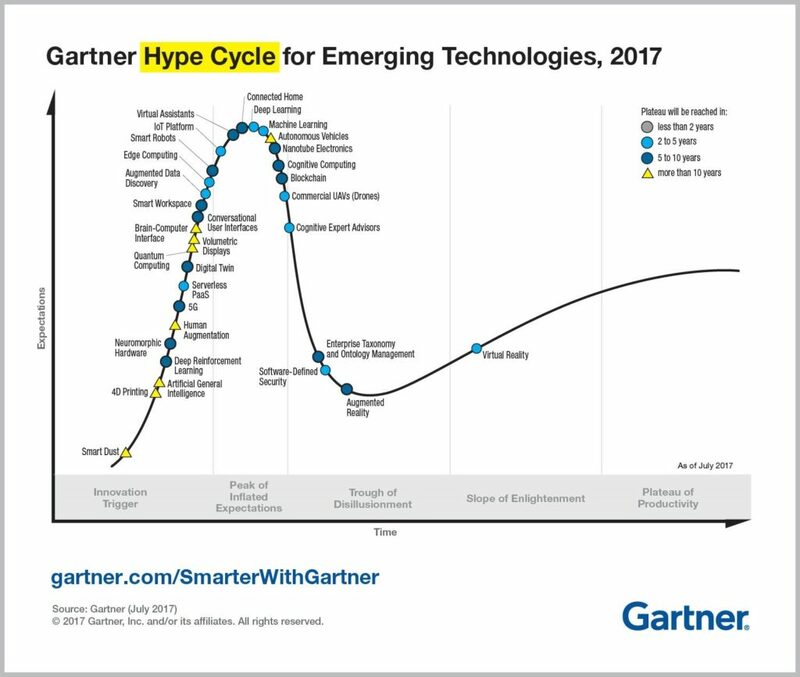 By the end of 2017, such technologies left the Gartner Trends for Emerging Technologies and moved to a commodity market category where the competition is rather based on performance instead of value and technology breakthrough, or additional features and price. The overall message behind this trend is that we, people in general, need to adapter faster. This trend directly relates to the newest HR trends for 2020 saying that “adaptability” will be one of the most important skills to have. In conclusion, it seems that technologies are more and more embedding coaching approaches, that question, prompt, suggest, collect feedback and follow the user through their process of change. All of this is offering the individual a continuous learning process available 24-7 at the lowest cost. We were very happy to have been among the startups showcased at Eureka Park this year. Based on psychology, linguistics and neuroscience, PocketConfidant is one of the first technologies entirely dedicated to coaching the individual through natural and real-time language. The philosophy behind this technology is to build an intelligent system grounded in the ethics of coaching practice: listening, questioning, goodwill and non-influence. We work with the premise that technology needs to benefit the Individual, facilitate the development of the “self” in a completely confidential, purposeful and continuous way, always aligning with her readiness and motivation for change and emotional and cognitive availability. 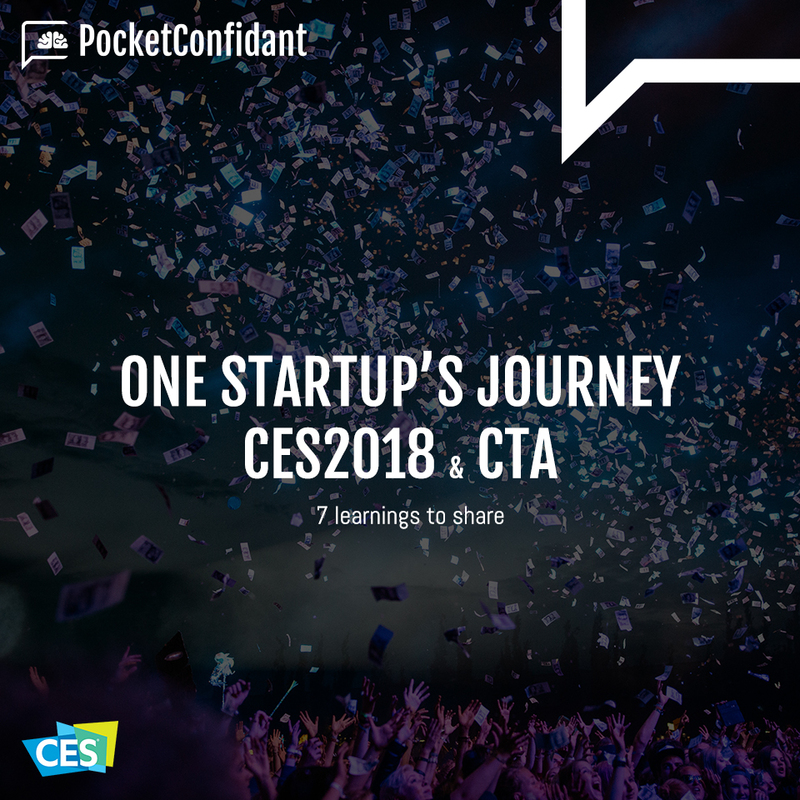 Article’s bonus: Learnings of the Day from Team PocketConfidant @ CES 2018. Team PocketConfidant is happy to share their learnings with the public, hoping that they can be helpful to future teams participating in activities of similar scale. We are very grateful to our membership program CTA and our sponsor Région Provence Alpes Côte D’Azur for this amazing experience. CES2018 officially wrapped after dazzling the world with a glimpse into the future. More than 3,900 exhibitors showcased world-changing technologies that spanned more than 2.75 million net square feet of exhibit space across Las Vegas – the largest show floor in CES’ 51-year history.